Coconut is a well-known fruit for its endless benefits ranging from its use in the kitchen to its role in the beauty industry. Coconut oil, in general, is one of the most praised natural oils. It is rich in a variety of vitamins such as vitamin K and E and also it contains considerable amounts of lauric acid and iron elements. Most women in the beauty industry today have known the secrets of coconut oil and have endorsed its use. A good example of a model who has endorsed the use of coconut oil is Miranda Kerr who is a Victoria Secret’s model. To those who want to improve their beauty, here is some good news for you, you do not need to ingest the coconut oil in order to enjoy its benefits. Here are some of the lifehacks, beauty tips as well as tricks of the coconut oil which range from skin care, hair care to improved wellness of the general body. Coconut oil is the best-known secret behind thick, long and shiny locks. It is well known for giving hair intense moisture as well as fighting dandruff. Most of the hair care shampoos and conditioners today have incorporated coconut oil as one of their main ingredients. Conditioning your hair using coconut oil is a simple task. Warm the coconut oil slightly before applying it to your hair. Using a shower cap or a wet towel wrap your hair for a few hours before washing it out. You may even spend the night with your hair covered before washing it out depending on nature and the needs of your hair. Some people also suffer from dry and frizzy hair. In such a case, you need to use the coconut oil to massage through the roots of your hair while scrunching them in order to create volume. This helps moisturize your hair. Another one of coconut oil lifehacks using it as a makeup remover. It is an efficient makeup remover in that it has the ability to solubilize water-resistant elements that are present in most of the beauty products such as eye shadows and mascara. It also plays a great role in maintaining the moisture of your face, reducing wrinkles and also giving your face a clear look. For effective results, take a cotton pad and dip it in a solution of coconut oil and use it to wipe off the makeup from your face. An added benefit of using coconut oil to remove makeup from your eyes is that it seeps into your eyelashes which helps in conditioning them as well as promoting their growth. Its moisturizing and nourishing qualities makes it efficient for use as a lip balm. It helps soothe dry and chapped lips giving them a soft and healthy look. If you suffer from dry and chapped lips, mix warm coconut oil with small amounts of honey and sugar and use the resulting mixture to exfoliate your lips. Apply it regularly for best results. Coconut oil is rich in antioxidants which helps reduce aging of the skin through its ability to fight free radicals. It can be used as a lotion on its own or it can be added to another form of lotion. It also works efficiently in fighting eczema and acne. The best way to do this is applying the coconut oil on your body after a shower or bath. It gives your skin a glowing, smooth young look. This is another trick of coconut oil which is not well known to many people. Using coconut oil as shaving cream helps moisturize the skin thus preventing razor burns. The results are more efficient when the oil is applied together with Aloe Vera. Coconut oil is also used as a body scrub. It has a great exfoliating character that helps keep your skin fresh and moisturized. Mix coconut oil with either sugar or some sea salt to make an exfoliating coconut oil body scrub. You may add lemon or honey to improve its smell. Adding vanilla extract, freshly crushed lavender and olive oil also help improve its scent. This body scrub will leave your skin feeling young and refreshed and it will also give it a glowing complexion. This is another one of the many tricks of coconut oil. It is mainly for those with skin allergies for whom it is hard to find soaps that do not cause irritation to their sensitive skin. Coconut oil is known for its soothing effect on the skin and thus recommended for individuals with sensitive skin. It helps heal the skin giving one a healthy glowing complexion. The kinds of toothpaste we use on a daily basis contain a lot of organic chemicals in their composition. Coconut oil is an effective element for cleaning our teeth. To make an organic toothpaste, mix coconut oil and baking soda to make a paste. Use the resulting paste as your toothpaste. This helps in killing bacteria from your mouth while still improving the appearance of your teeth. The white color of your teeth becomes whiter. If you suffer from dark patches on your elbows and knees and this sometimes affects your confidence depending on the type of clothe you wear, here is a solution to your problem. 1 teaspoon of coconut oil mixed with juice from 1 lemon forms the solution to your problem. Gently rub the resulting mixture on to the affected areas to help remove the dark patches. Coconut oil is rich in fatty acids that are easily absorbed into the skin ensuring that the body cells get the nutrients they need. This oil helps in strengthening your nails and also prevents the aging of your hands. It is also effective in preventing the appearance of wrinkles. Gently massage coconut oil on the nails to help strengthen the cuticles and for the overall health of your nails and hands. 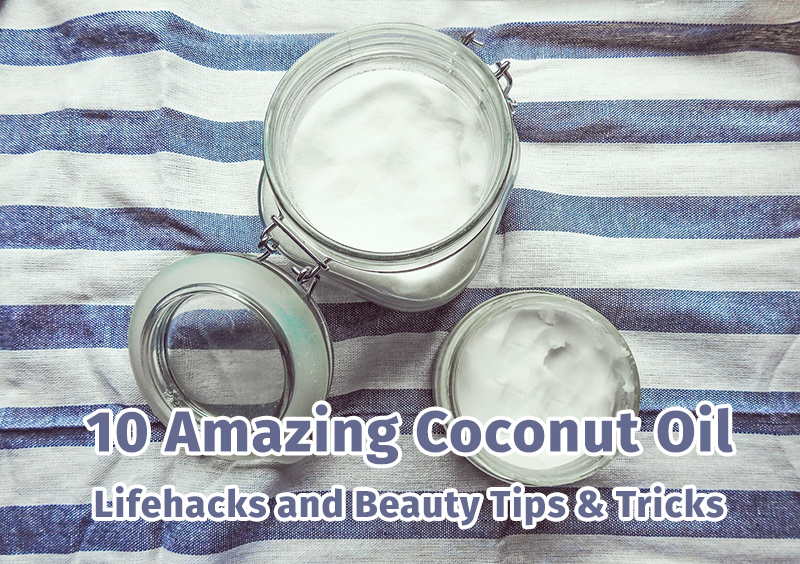 Making use of the above-mentioned coconut lifehacks and beauty tricks will play a great role in improving your overall beauty starting with your hair, to your face and skin as well your general body. Try them out for best results!